I'm of the opinion that folks are welcome to do whatever they'd like with their bodies. I've seen my fair share of what I consider to be "poorly executed tattoos." As tattoos are permanent commitments of expressions, I think it's important that folks give serious thought to getting a tattoo. A tattoo, after all, tells a story about a person. The best stories are those that are well-thought-out. For what it's worth, this isn't my first tattoo. I already have a whole bunch of tattoos on my body. These tattoos are in the forms of scars. Each of my scars tells a story. My flesh is full of stories. The thick scar on my right knee, for example, tells about the time I missed the jump over the rose bushes that divided the neighbors' yards. As a pig-tailed girl, I would draw two eyes above the linear scar, and then push the two ends of the scar line upwards so that it formed a smile. I called my smiling scar "Hermey." The scar on my right ankle tells about the time that I had pins surgically implanted too reconstruct a bone broken during my first-ever soccer match. The parallel scars on my left palm tell about the time I was rock climbing near Mt Shasta a few years back. There was an awkward, angled start to the climb. I missed the first hold and the sharp rock cut deep into my hand. As I see it, there are two differences between scar tattoos and ink tattoos. For one, scar tattoos are unintentional. For two, scar tattoos are the result of unfortunate occurrences. (Yes, I am clumsy.) With ink tattoos, how nice it is to have an well-intentioned intentional scar! I've wanted a tattoo for as long as I can remember. It's been on my bucket list ever since I started recording my bucket lists. And while it's a relatively easy item to cross of the list, it's not one I was ever going to take lightly. A few months ago, I start noticing some internal nudges telling me that it was time to start pursuing the tattoo. Roots hold me close; wings set me free. This is a quote that very aptly describes me and the choices I've made in my life. Decision made! My tattoo would be of a woman with a tree for a body, roots for feet, and wings for branches. 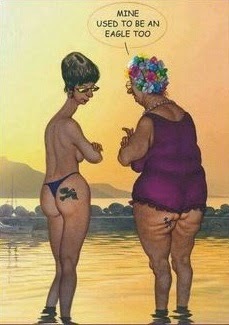 The tattoo must be in a place on my body that isn't going to change too drastically as I age. (This means no tattoos in sag-prone areas). After giving location a lot of thought, I decided that my ankle would be the best location for my tattoo. I've always loved ankle jewelry, and so I thought I'd incorporate the tattoo into an ankle band. Fortunately, a tattooed ankle decoration is one that cannot be lost or stolen. And, because it's one and the same with my skin, it doesn't need to be removed every time I wear my hiking boots. Some of my early tattoo sketches. I kept coming back to the designs every few weeks, tweaking them a bit here-and-there, and leveraging the benefit of time to ensure that I really wanted to go through with this permanent modification to my body. Each time I looked at the designs, I got more and more excited. This was a sure sign to me that I was ready to make the plunge. After a few months, I felt as though I had done as much as I could do with the designs; it was time to begin working with a tattoo artist to flesh out the final piece. 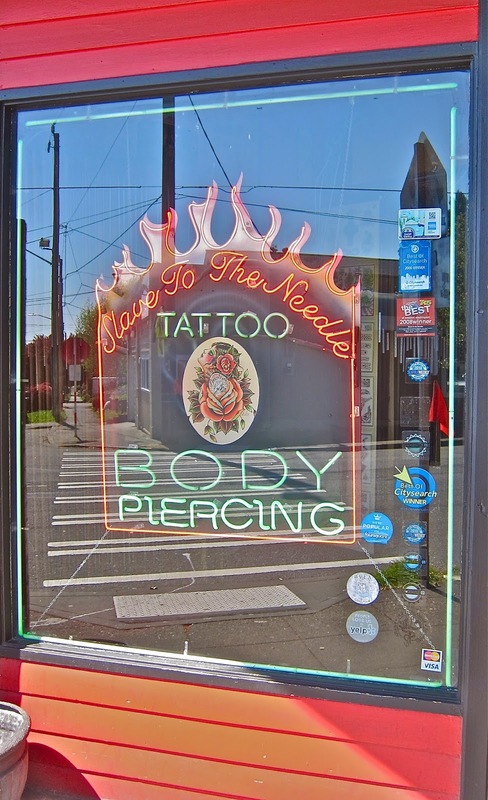 I choose to have my tattoo done at Slave to the Needle, the most reputable shop in Seattle, and the same shop that did my nose piercing (as described in Piercings & Doin' It). Slave to the Needle -- my tattoo & piercing shop of choice. In late March, I had a brief consultation with Andrea Ottlewski, my tattoo artist of choice. We discussed my design, I paid my deposit, and I scheduled my appointment for the following month. Andrea was fantastic! She did a great job translating my struggling sketches into the exact tattoo that I had envisioned. She sent me a couple of draft designs before the appointment, and with a few minor adjustments, we were good-to-go. I headed back to Slave to the Needle at noon on Monday, April 20th to get inked. I was soooo excited! Andrea began by using a template to transfer the design to my ankle. The tattoo template was transferred to my ankle. We spent quite a bit of time adjusting the template around my ankle. Because of the curviness and varied positions of an ankle, it's tricky to get a band to appear level from all angles. Once we were both pleased with the placement of the tattoo, Andrea used a Sharpie marker to close off the band. Andrea drew the final part of the ankle band with an orange Sharpie. And then the inking began. While Andrea was doing her tattoo magic, I was instructed to lay down and to be super-duper still, as any movement in my upper body would cause residual movement in my lower body. When you've got a tattoo gun loaded with inky ammunition hovering over your skin, you don't want to move. Between ink refills, I did, however, move long enough to capture this photo of the tattoo in-progress. Looks like an inky crime scene! You: So...how long did it take? Me: The whole process took about an hour. Me: Well, it didn't exactly feel like unicorns and butterflies. Then again, it wasn't nearly as bad as I thought it might be. For me, the buzzing sound of the tattoo machine was the least pleasant of the sensations. 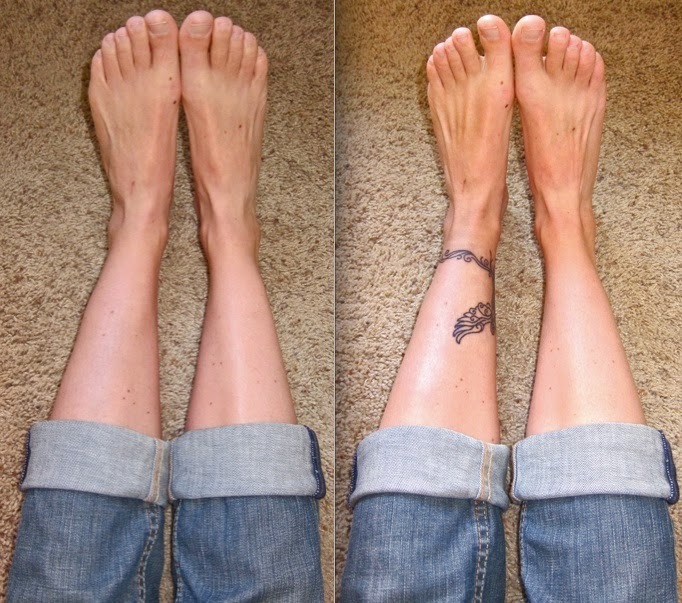 And I did experience some involuntary twitches when Andrea tattooed over my Achilles tendon. Andrea inks the ankle band over my Achilles tendon. For a few hours after the tattooing, the area felt as though I had received a really severe sunburn. After that, though, there were no abnormal sensations. 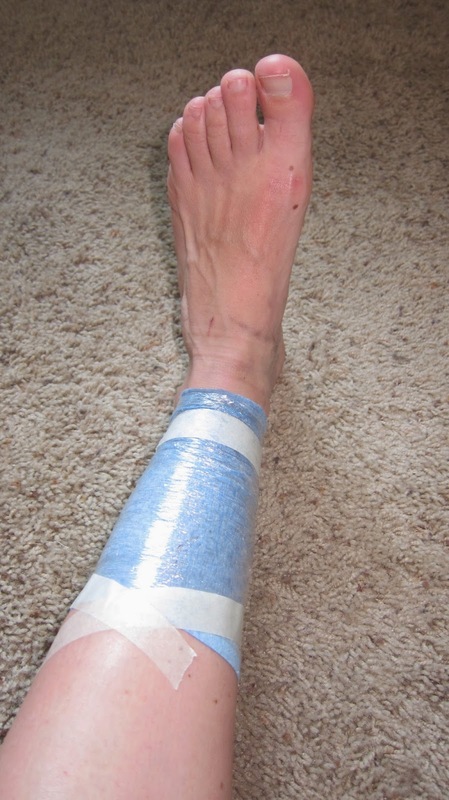 When all was said-and-done, a temporary bandage-like cloth and a plastic wrap were placed around the tattoo. I was told to keep the wrap on for a few hours before washing the tattoo with soap and water and subsequently beginning the ointment and lotion treatments. and the ankle band wrapping around the outside of my ankle. Yeah for crossing items off bucket lists! I love my new tattoo! I'm really happy with how it turned out! I now have a well-intended intentional scar that tells a story about my airy-fairy, well-rooted life. Little did I know that I would receive an unintended benefit of getting a tattoo...I now have something in common with sailors and whores! Thanks, Ro! That's right -- I remember you mentioning her name. Andrea has been highly recommended by a number of folks. Great to hear from you, by the way. Hope all is well! When I first started reading this post I was shocked you were going in for your first tattoo. Not because I am against them, but because somewhere in my subconscious I always figured you had one somewhere. it just fits ya! Then reading about the scars and the stories they tell (I have a few myself) it made perfect sense. Michelle and I joke about your Rule #1. As soon as someone tattoos the name on the arm, its the kiss of death for the relationship! Tattooing someone's name is indeed a kiss of death. I was looking at some tattoo-related cartoons and jokes yesterday. There were some really great ones. Many of them had to do with tattoos of people's names. My dad had my Mom's name in a heart done back when he was 20. Not one of his many girlfriends, nor his second wife, liked that at ALL! One of my students in my last class was one of those who went hog wild, she got one and next thing she knew, her back was covered in them. She just won a prize from a Spokane TV station for free laser removal. She says that hurts MUCH worse! I wouldn't ever want to go the swallow-my-choices-laser-removal route. "There's a saying that the difference between people with tattoos and people without tattoos is that the people with tattoos don't care whether or not you've got one." That seems like a gross generalization. Living here in Seattle and seeing how common tattoos have become, it isn't a surprise that there are many people with tattoos who do care about whether or not others have them. Ironically, the fact that tattoos have become so popular kind of puts it in the place of being the "norm", as opposed to being edgy and counterculture as it was years ago. (Seriously, who under the age of 65 still thinks tattoos are only for 'sailors and whores'?) In my experience, there is now that peer pressure that comes with things that are seen as favored by a majority - in favor of getting tattoos, not against. I've certainly never heard of anyone - in Seattle at least - who has no tattoos judge those who do. As I noted, people have just as many opinions about tattoos as they do about religion and politics. Thanks for sharing your opinions, CJ.